Betting obviously carries risks, it is important to remember that regardless of the odds, it is possible for customers to lose every penny staked. It is therefore important that customers only deposit what they can afford to lose to the betting account. Withdrawals can take time to be returned so customers should not be reliant on winnings to support other immediate costs. All bookmakers will make an account history available to each customer which can be used to track profit and loss and to manage spending. 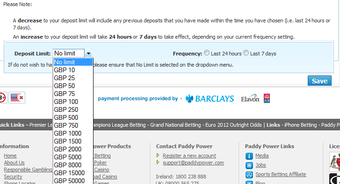 Bookmakers should also offer deposit limits, customers should use this facility to prevent deposits above a pre-agreed amount within a given time frame, this is shown in image 1. Customers should maintain gambling as a hobby alongside other interests and it should always be seen as fun. Online betting customers can become emotionally detached from their money which is simply shown as a sum on a screen. Customers should make decisions on betting spend based on the cash they would spend if they were at a counter in a betting shop. The stake should not be greater than the amount a customer is prepared to lose on an event and should correlate to the available balance or betting budget. As the odds represent the risk of a bet longer odds should be allocated a smaller stake and vice versa (For example if a customer is staking £50 at odds of 1/2, their stake for a long odds bet of 5/1 may be just £5). An example of five bets with varied stakes is shown in image 2. If stakes relate to the available balance and the odds then the expected winnings will automatically be realistic. If two bets of equal stake at long odds of 5/1 take up a customer's entire available balance then there is a good chance of losing the entire balance. However, if they take up just 10% of the balance then the customer would be able to place 20 bets in all, and not expect to lose the entire balance. If a customer has £100 to bet with then the chance of turning this into £1000 in a small number of bets, against the chance of losing will be unfavourable (to do this would require the customer to be considerably better than the market itself). If a customer manages stakes and expected winnings then they will bet more bets considering their balance meaning their account shows a greater risk diversification. This means overall their reward will offer a fair reflection of the quality of their betting selections (having fewer bets means less risk diversification and a more volatile profit /loss). When losses have been incurred customers should avoid increasing stakes to chase losses, this would involve betting more on the next bet so potential winnings would eradicate the previous loss. Maintaining emotional control and taking a ‘time out’ after a loss is important, particularly if a loss has been incurred on a tight bet. Similarly customers should refrain from frivolously wagering winnings, in this case customers may feel their next stake is simply ‘playing with the bookmakers money’. It should be remembered that winnings are needed to compensate losses; customers should in fact view their betting activity over time to gain a full picture. After a large win customers may be advised to withdraw a sum of money which covers a previous deposit. Customers should be aware of bets that may not be fully interdependent. 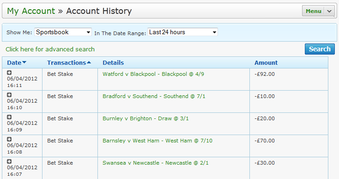 An example of this would be betting on a team to win, and a first goal scorer from the same team. In this instance if a player on the opposing team scores first then not only will the bet first goal scorer bet be lost, but the bet on a team to win will be in an unfavourable position. Another example of this is that in horse racing it is possible to bet on two or more horses to win meaning potential winnings can only be from one bet winning, with potential loss the combined stakes of the two bets. Winnings will comprise the payout of the winning horse minus the stakes placed on any other horses, as shown in image 3. Customers need to consider interdependence when making bet selections, and deciding on stakes. There are a number of outlets for advice, help and support for betting customers. Each individual bookmaker should provide information and contact options, as well as offering tools such as deposit and stake limits. Self exclusion is also available for customers who wish to block their account and details for a set period of time as shown in Image 4. A range of charities also exist to help people needing guidance, or who are experiencing problems with gambling. Gamcare are an example of one of the UK’s leading gambling charities, their help line number is 0845 6000133. Gamecare provide online forums and chat rooms at http://www.gamcare.org.uk/.